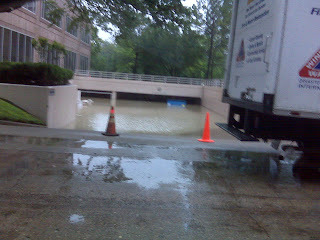 I wanted to share some pictures with you of the massive flooding we experienced in my office building last week. The construction workers are still working vigorously to whip our building back into shape as we speak. We had over 8 feet of water in the basement where our little deli was stationed and all our electrical (heating, air, phones, etc.) equipment was stored. So it's pretty amazing that they got us back into our offices in 5 business days! Remember when I wrote last Tuesday I was working from home? That was the day of the torrential down pour. 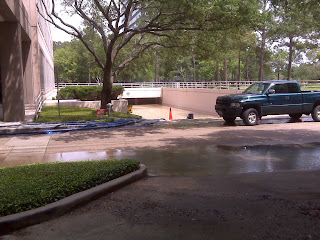 This is the back of my building where the ramp leads to the basement. You can see the brown, mucky water rose all the way to ground level! 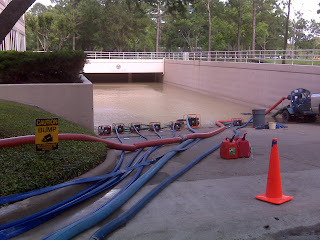 They had some massive pumps running constantly to try and get rid of the water. All these picture were taken by somebody in my office. I did not get near this. Now, they are blowing air from the outside in to dry and manually air condition the building. It will take months for them to rip out and reconstruct the basement. I will miss my little runs to the deli for a soda or snack. 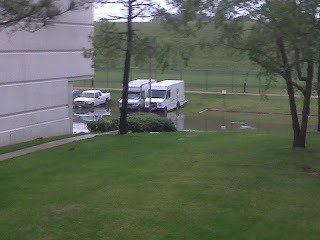 :( Oh, and did I mention that they found E. coli bacteria in the water!! It may have been a little soon to return to the building. I think it will take awhile for things to return to normal around here. I'm just glad nobody was hurt in all this mess. These are the blowers surrounding the building and they are also coming through windows and ceilings. Yesterday was my first day back to the office and this was what I saw in the parking garage. Their home was flooded out and they had taken up residency in the garage. BTW, we have a million of these duck looking animals around our complex. No one is quite sure what breed they are. They have a weird looking faces, but the babies are still cute! Join greenarctxre.blogspot.com to support the green revolution that is how architecture and design can change our consumist lifestyle and save our planet. to support us economicaly clic on the ads. support th green revolution! support the planet! Join http://greenarctxre.blogspot.com to support the green revolution that is how architecture and design can change our consumist lifestyle and save our planet.